Sharkskin is one of our featured Spring 2017 fabrics, and this season we’re offering some truly special styles, like our brand new luxury Sharkskin suit separates and our ever-popular Sharkskin pants. First, however, a brief primer! 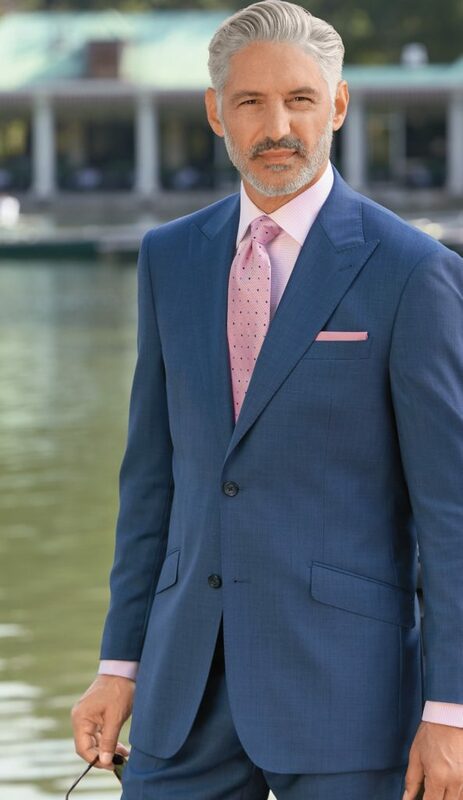 The Premium Super 120’s Sharkskin Suit is the newest style in our suit separates offerings. It’s absolutely an essential, thanks to a smartly tailored fit, in your choice of the incredibly versatile tones of cool gray, warm tan, or slate blue – all with Sharkskin’s trademark sheen, naturally. The Super 120’s element is what really sets this suit apart. That number refers to the fineness of the individual fibers spun into the yarn; the higher the number, the smoother and softer the fabric. Therefore, our Super 120’s Separates are very smooth and soft to the touch, and you’ll notice that the Sharkskin luster is enhanced by the richness of the Super 120’s fabric. Add in sharp details like a peak lapel, angled pockets, and pick stitch lapels, and you’ve got a remarkable product that is an unbeatable value for the man who wants to distinguish himself from the rest. In addition to its striking good looks, Sharkskin boasts quite a few wearable benefits. Thanks to its construction, Sharkskin is a breathable and moisture-wicking, so it’s the perfect fit for transitional weather in the Spring and Fall. Our Sharkskin styles are weighted for year-round wear and are exceptionally durable, so they’re in it for the long haul. You might want to consider Sharkskin Pants, which are an especially sought-after style in our dress pant collection. Sharkskin is understated enough for the office, but would also be perfect for a night on the town. It pairs well with pale colors; the most important thing, though, is to keep the rest of your look matte and let the Sharkskin do the work. Our Sharkskin is an elegant, polished fabrication that adds distinction, whether as a suit or as pants, to anyone’s wardrobe. Thanks for the information it came at the right time. We’re so glad you found this post helpful, Hilliard! I live in south Florida. Will I find these slacks too heavy for the humidity and heat? I do understand these are not “tropical weight” fabric. Thanks. Hello Dave! Sharkskin is a very fine fabric as it is 120’s thread count, so it’s a suit that we do recommend for humid climates. While we are confident that you will be pleased with it, we back all of our products with a 90 day Return and Exchange Policy. If you would like to see a sample of the fabric before purchasing, our Customer Service Department can send one to you if you reside within the continental United States – just email custserv@paulfredrick.com with the color you would like a sample of and your address. I have used use sharkskin in my younger days, in fact in the late fifties and early sixties. I am excited about the prospect of getting myself a sharkskin suit.